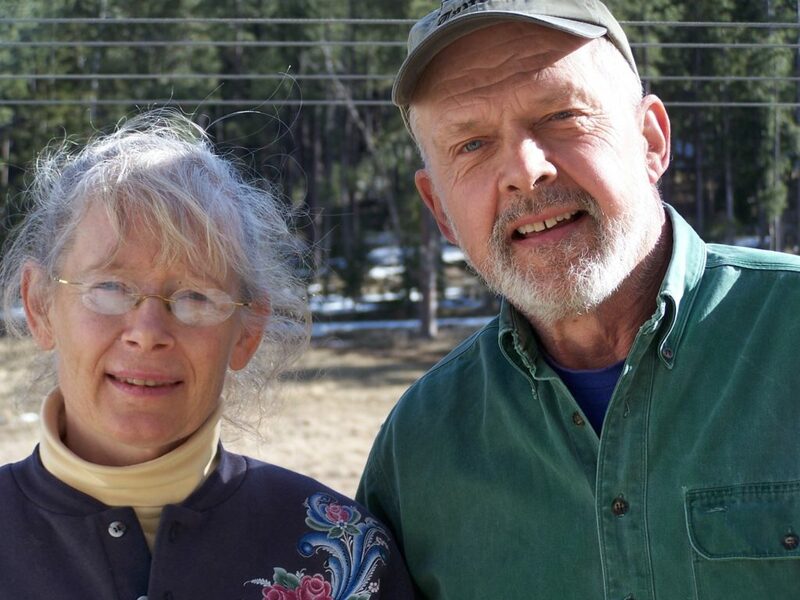 We (Kim and Don Kelley) live on a small farm in the Nemo area of the Black Hills, where we grow most of our own vegetables and fruit. We think living in South Dakota implies that you believe in self-reliance, and we like that ideal. When we recently began to plan for our new home we approached it with this same self-reliance perspective, and after feeling the continual rise in utility bills over the years, we’re under no illusion that the upward trend will change. Consequently we decided to go for maximum energy efficiency and renewable energy. This new house project will result in our paying only for phone and internet utilities, plus small amounts of propane for cooking and back-up water heating. Since our home is in a valley without much wind energy potential, we decided on solar electricity, also referred to as photovoltaic or PV. The more we learned about the practicality and affordability of solar power, the less we thought of it as something exotic or unreliable. Plus, we were already sold on the value of passive solar space heating, super insulation, and efficient lighting and appliances. These things made sense to us even without our basic commitment to reducing our carbon/energy footprint. Our involvement with DRA’s Community Energy Development Committee has solidified our hope that South Dakotans will increasingly believe that energy conservation is the way to go, for lots of reasons. We have worked toward our goal in a long-term, do-it-yourself manner. Our off-grid, solar-electric power system has been supplying all our electricity for the last 2 years. The system is off-grid, rather than grid-tied, mainly because of SD’s lack of a net-metering incentive. Utilities in SD (unlike those in almost all other states) are not required to pay for electricity sent to them from customers at a rate comparable to what they charge consumers. 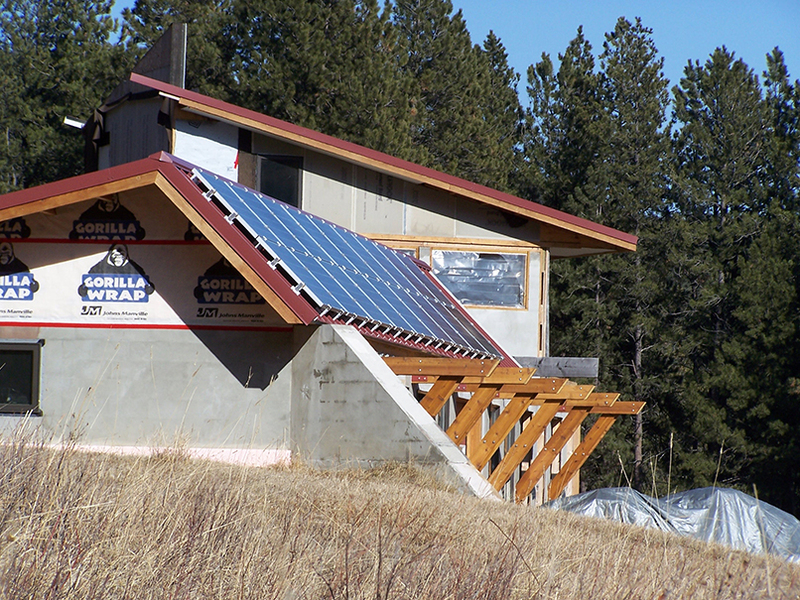 The new solar house is also a mile distant from the nearest electrical power line. We found that the cost of trenching and installing a power link would have been comparable to the total investment for our independent electrical system. This, along with the lack of a net-metering incentive for cost recovery, led us to include a battery bank in the system rather than tying into the grid. Other features of the house presently include: Passive solar construction (using the thermal mass of concrete and masonry to absorb the sun’s heat from south-facing windows); earth berming around the lower story; extra attention to wall, ceiling, and floor insulation and general air-tightness; a wood-burning masonry heater for supplemental space heating (sometimes called a “Finnish” or “Russian” stove, requiring much less wood and emitting much less pollution than regular wood stoves); and energy-efficient lighting and appliances. Features planned but not yet installed will include: Roof collectors for solar domestic hot water supply; rainwater collection and purification for domestic use; and composting toilets (greatly reducing water consumption). The solar-electric system has performed flawlessly, powering our household needs as well as heavy-duty power tools. We have been delighted with its essentially carefree operation, without significant compromise of creature comforts or convenience. Although at the time we began building it was difficult to find local qualified solar installers (so we designed and installed the system ourselves), that situation has now changed. And although our electrical generation system cost us about what you’d spend for a new, full-size pickup truck, prices have since come down and continue to head downward. Federal incentives have also become more attractive in recent years. Had we been living in some states with their own incentive programs, our system would have cost about half what it did—SD has no comparable program as yet. DRA’s CED committee is currently working on gathering basic information for people to decrease their energy bills, as well as a list of professionals in the state that help with energy assessments and other energy services. In the meantime, if you have any general questions please direct them towards Luke Temple at: luket@dakotarural.org. Although we can’t claim to be experts in renewable energy or energy efficiency, Luke can forward any specific questions folks may have about our home and experiences and we’d be happy to talk, perhaps steering them to professionals for more detailed answers.